If there’s something we love more than skin care (believe us, there are very few things that top the list), it’s food. And while we’re willing to admit that yes, you should eat to live, mindful eating allow you to live to eat. We can be happy and healthy and have beautiful skin! Smoothies are often our breakfast go-to: they’re quick, they’re easy for those on the go, go, go, and they pack a punch. Not only does it have enough protein to keep you going until lunchtime, but it also gets you a serving of all the greens (and good stuff in the fridge) without you tasting a thing. 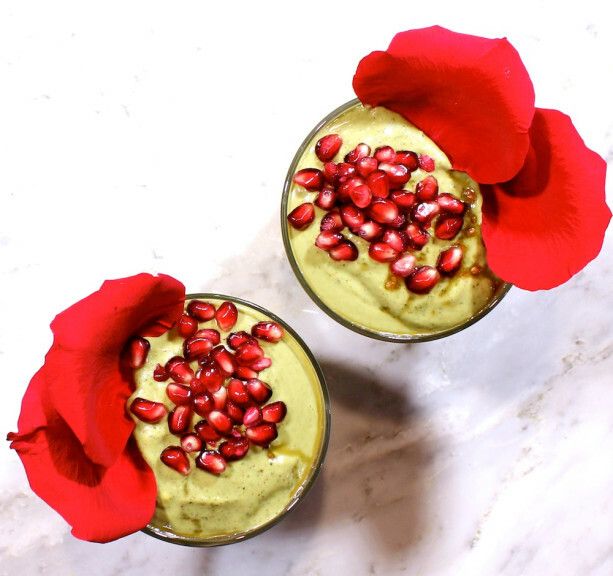 Banana, kale, oats, almond butter, honey, and pomegranate seeds offer potent antioxidant, brightening, and smoothing benefits that give you – and your skin – a glowing boost. With salad as our go-to meal a good 80 percent of the time, we’re always on the hunt for a new combination to jazz things up a bit. This one is a year-round favorite: it’s bright, it’s colorful, and it’s chock full of all the good stuff. 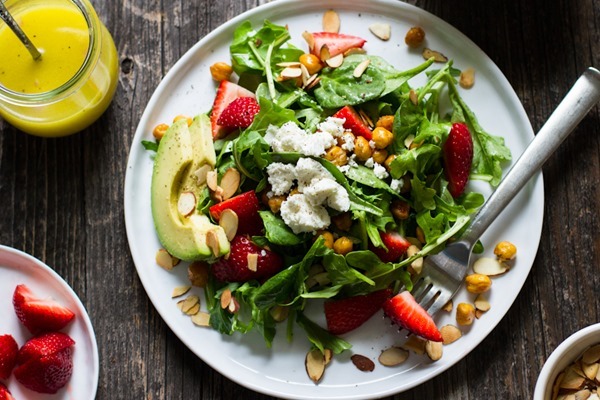 Strawberries, for some potent antioxidant Vitamin C; avocados for good-for-you fats to lend skin a dewy glow; baby spinach for wrinkle-fighting vitamins and minerals; and lemon juice for added detox benefits (and zingy zest!). Sometimes we’re after a bit of kick – so rocket it is. 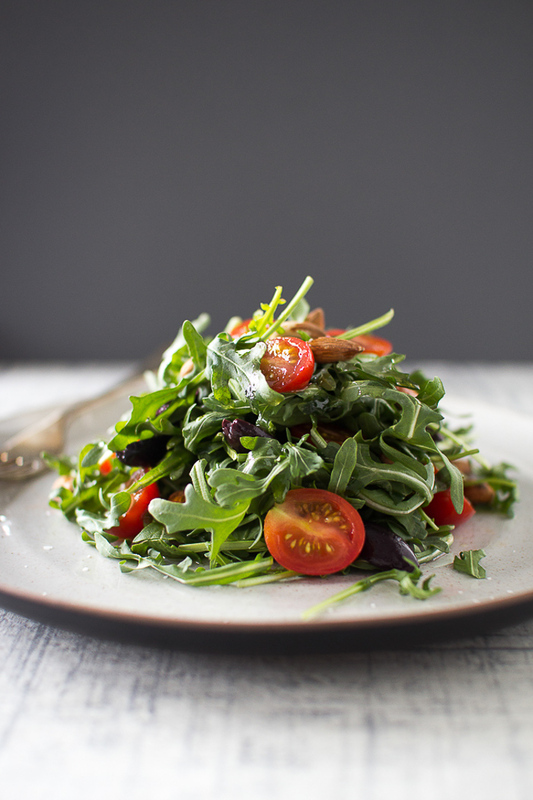 Arugula is a super nutritious leafy green boasting incredible antioxidant strength (it has a high oxygen radical absorbance capacity); it is also rich in phytochemicals known to counter cancer-cell growth. Plus, it’s ranks right along kale as an excellent source of Vitamin A, C, and K. Toss in some fresh tomatoes and olives for even more Vitamin A and a skin-smoothing, anti-aging boost. Are you drooling yet? We usually nix the bacon, but hey – sometimes a little indulgence is just what you need after a long week. 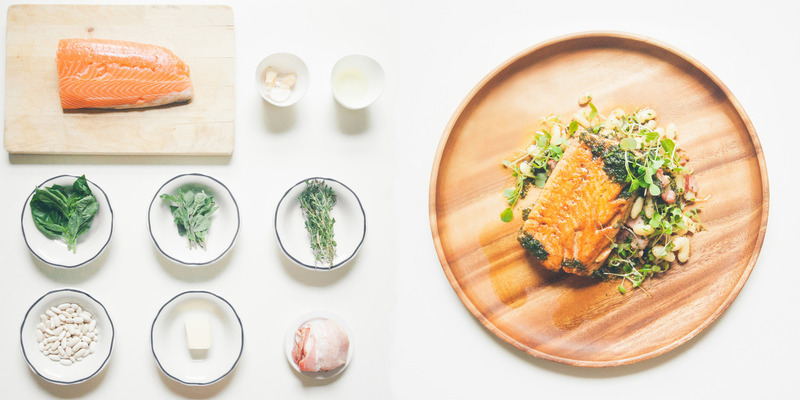 The base of this meal is fresh salmon, which is rich in necessary omega-3 fatty acids that help balance skin to reduce acne and wrinkle-causing inflammation. White beans harbor great antioxidant value for skin-smoothing benefits, while basil boasts the ability to help beat blemishes and lower stress. This one has been a summer-long favorite, and still is now that the days are shorter and a bit colder (and we’re doing our grilling on the stovetop grill-pan!). 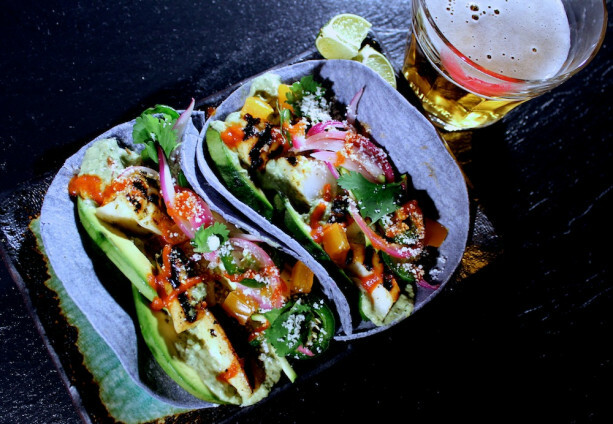 In the spirit of keeping that late-night, outdoor grilling post-lazy beach day feeling, we’re keeping these Baja Beach Tacos on the menu until we get tired of them (we haven’t yet). What we love most is how easily customizable this recipe is: change the fish, add more or less of whatever seasoning and veggies you’re craving, etc. Make it yours! What’s given is the omega-3 fatty acids, skin-brightening and smoothing lutein, and other antioxidant-rich vegetables you’re bound to get from this meal.